Scotty Nguyen was born in 1962 in a south-central Vietnamese town. In a time of war and conflicts, the community was affected and poverty was common. Amidst all this and another 12 young children, Nguyen’s mother saved some money and managed to send 11-year-old Scotty to the United States hoping he would have a better future. First stopping and working for a while in Taiwan, Scotty found shelter with an American family who later on volunteered to sponsor him to go to the US. At 13, he arrived in the United States and found it very hard being alone and having to adapt to this new world, people and culture. He also found it hard to adapt to the new weather and climate, especially since he was living in Illinois. He eventually moved and settled in California, where the milder climate suited him better. Unfortunately, Scotty soon found stealing more interesting than school and he started missing class, later on discovering poker. He tried it out at a friend’s house, and soon gathered more interest and joined the pool halls and backrooms. In his early 20s he moved to Vegas to be part of the real action and settled there to learn the trade. This was a place he heard of when he was in Vietnam and somewhere he had always dreamed to be. With this intent, he took a job there cleaning tables at a casino and started building up a bankroll. It was at this job he acquired his name, “Scotty” by his manager because nobody would be able to say the name “Thuan”. When he played, his interest in the game was big but he was still at beginner level and lost his savings. Then he took a job dealing cards at Harrah’s Holiday Casino and then at the Golden Nugget. Dealing cards proved to be useful for observing the skills and errors of his customers and he cultured a better understanding of the game. He began applying his new knowledge to the low-limit games he was playing and his confidence and account grew likewise. In 1997, Scotty’s idol was Stu Unger who had just won the World Series of Poker Championship Event. He would tell himself that one day it would be him winning the World Series. Scooty’s dream to play poker professionally kept growing and at 23, he stopped dealing cards and started out in poker full time. That’s when he started making a name for himself in the poker world. In May of 1998, Scotty gathered $10,000 cash to buy a seat at the World Series of Poker Championship Event, hosted at Binion’s Horseshoe Casino. After three days of nonstop play, Scotty got himself to the final table. That year was the first time in WSOP history that the final table started with only five players instead of six. After several hours, Scotty was heads up with Kevin McBride for the $1 million prize money and the WSOP title and bracelet. Scotty pushed his chips all in and was crowned the world champion of poker. Later, in January 2006, Scotty won the coveted World Poker Tour championship title in an unprecedented one hand only. Also in 2006, he as featured in a Diet Pepsi commercial in 2006 with Phil Hellmuth and Daniel Negreanu. In 2007, he suffered a meltdown and depression following his 11th-place finish in the Main Event and at the 2008 WSOP H.O.R.S.E. final table, he appeared to be drunk bashing his opponents and the staff with contempt and rudeness. Fans were angered with his uncharacteristically belligerent behaviour and Scotty apologised. 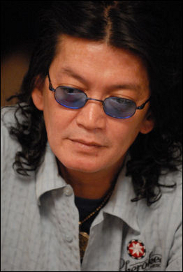 Nguyen is an Omaha Hi-Lo specialist and to date has acquired a total of five WSOP titles since 1995, including the championship title. He considers himself to be the people’s poker champion and his achievements are impressive. He is the only player worldwide who made the final table in all WPT seasons and his total live tournament winnings exceed $6.7 million classifying him 9th in the all time worldwide money list. He is 2nd in the WSOP all time worldwide Omaha hi/lo list and has acquired four World Poker Tour (WPT) titles, including the championship title making him the third in the world to have ever held championship titles in both internationally coveted events. He was the first player in history to win the triple crown of a WPT Championship, the WSOP Main Event and the WSOP H.O.R.S.E. Championship. In his free time, he loves spending time at home with his wife, Julie bbq-ing. He has two small Japanese monkeys. He is down-to-earth and confident, practices Buddhism with a positive outlook. Scotty is the first to admit that his fans have pushed him to where he is today. His fans and poker enthusiasts fly in from all over the world just to see him play. warm and kind attitude, greeting every fan he meets and has achieved the admiration of his opponents. His gentlemanlike manners, friendly chatter and professionalism make him hard to hate, even when he is fiercely aggressive and competitive at the tables. Carrying exuberance, charisma and a set of poker skills, Scotty is a unique character in the poker world has forever transformed the way poker is played and the way fans watch the game. With forty-four first place finishes and placing in more than 230 tournaments, he is the most recognizable and feared poker players of all times who continues to dominate the poker tables today.